Another exceptional album - vintage Lightfoot! 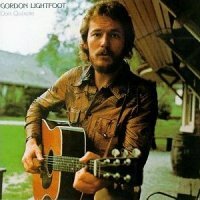 Don Quixote was Gordon Lightfoot's third album for Warner Bros. and his 8th overall (he released his 19th original album, A Painter Passing Through, in May, 1998, and his 20th, Harmony, in May, 2004). Along with his first Warner Bros. album, If You Could Read My Mind, and his most successful album on the Billboard charts, Sundown, Don Quixote showcases Lightfoot's singing and songwriting, and is a fine example of where this versatile artist was musically in the early 70s. The album is a wonderful collection of songs including some of the best and most popular he has written. There is not a top 10 hit on this album, but don't let that fool you into thinking there's no gold here. Every single song is superb, and today - 26 years later - Lightfoot is still performing no fewer than five of the songs from this album in concert. This includes the title song, Don Quixote, which contains some of the most brilliant lyrics he has ever written (and that is saying a lot!) plus Beautiful, Ode To Big Blue, Christian Island and On Susan's Floor, the last by Shel Silverstein and Vince Matthews. Thematically, this album is a sampling of what inspired and still inspires him ... love and love lost (Second Cup Of Coffee is one of his most poignant autobiographical songs), Canada, the outdoors and the environment, the tragedy of war, ships and the water, to name just a few. Even a collection such as Gord's Gold, with many more songs, fails to offer such a broad array of themes from a songwriter who writes so brilliantly about so many things in a way few others can. This is an album you will surely enjoy.